When planning for a new baby, one thing you may be curious about is how much time you'll have for maternity leave. 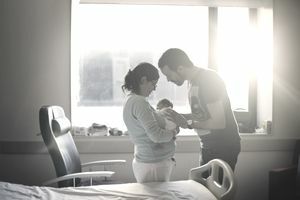 The Family and Medical Leave Act (FMLA) allows workers to take up to 12 workweeks in a 12-month period for parental leave to care for a newborn. Your job is protected in the meantime, although your employer isn't required to pay you for maternity leave. In fact, the U.S. is one of only a few industrialized countries that don't mandate paid maternity leave for new parents. But how do maternity leave policies in the U.S. compare to the average maternity leave in other countries? If you'll soon be taking time away from work to take care of a new bundle of joy, here's what you need to know. FMLA prescribes 12 weeks of unpaid leave for new parents but the average maternity leave often ends up being shorter. Approximately 70% of women report taking time off following a pregnancy, with the average maternity leave lasting 10 weeks. Roughly half of new moms take at least five weeks of leave, while 25% take nine weeks or longer to stay home with a new baby. When it comes to paid maternity leave, private companies can determine what to offer their employees. According to a 2018 Mercer survey, 40% of employers now offer some form of paid maternity leave, up from 25% in 2015. And several states have enacted legislation to provide paid family leave benefits for new parents; paid leave is available for up to eight weeks, although some participating states plan to extend this up to 12 weeks by 2020. In terms of how much pay new moms receive on maternity leave, the average weekly pay for state paid leave programs ranged from $637 to $1,216. Among private employers that offer paid parental leave, 80% provide their employees with full pay during the leave period. On average, paid maternity leave lasts four weeks. The companies with the most generous paid maternity leave policies include Netflix, The Bill and Melinda Gates Foundation, and Automattic. The first two offer 52 weeks of paid leave; Automattic comes in second with 32 weeks of paid leave. Compared to other countries, the U.S. lags behind when it comes to the average maternity leave length. More than 120 countries offer paid maternity leave and health benefits by law; the Czech Republic offers the most paid maternity leave by law, at 28 weeks. Just 33 countries mandate maternity leave of less than 12 weeks. The International Labor Organization (ILO) specifies guidelines for maternity leave standards, which are currently observed by 119 countries. The guidelines call for a minimum 12-week maternity leave, with at least 14 weeks recommended. And the standard established by the ILO also specifies that women should be paid at least two-thirds of their earnings while on leave, while receiving full health insurance benefits. Countries that adhere to the ILO standards require women to give their employers advance notice for taking paid maternity leave. One possibility may be that women are less likely to be the sole income-earners for their families in the U.S. compared to other nations. In Europe, for example, 59% of women provide half or more of their family's income, versus 55% in the U.S.
And while Americans largely support paid leave, they're not always willing to sacrifice their own financial well-being to make it a federal law. In a 2018 Cato survey, 74% of Americans are in favor of a federal paid policy for new mothers. But, more than half of Americans said they'd oppose it if funding such a policy using tax dollars increase their income tax liability by $450 or more. Regardless of whether you take the average maternity leave of 10 weeks, or go shorter or longer with your leave plans, you need to consider the financial impact if you won't be collecting a paycheck during that time. Specifically, review your budget to determine if you'll need to reduce spending temporarily. Check your emergency fund savings cushion to make sure you have money in reserves for unexpected costs. And finally, check to see if your employer offers short-term disability insurance that includes maternity coverage.